Rwanda’s national airline, RwandAir, is expected to have direct flights to Israel in the coming months. Cutting the ribbon for the Israeli embassy in Rwanda. Credit: Presidency of Rwanda. 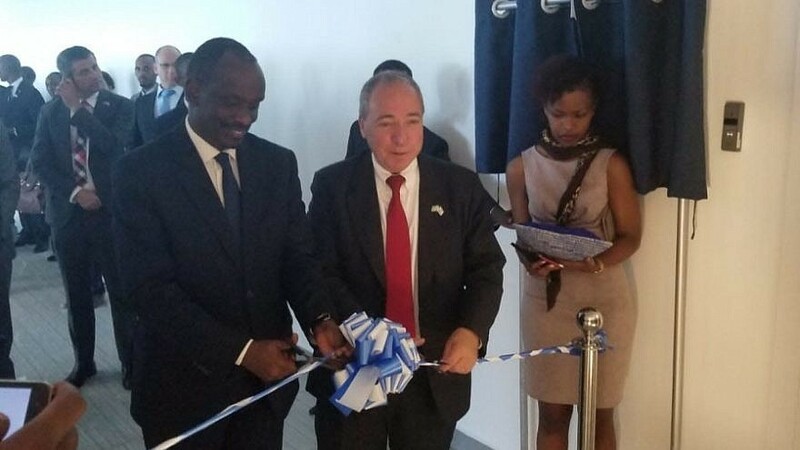 (April 2, 2019 / JNS) As part of its initiative to improve diplomatic relations with African countries, Israel opened its first embassy in Rwanda. “I’m certain that the opening of an Israeli embassy in Rwanda will elevate, within a few years, our ties to Rwanda and the continent as a whole to a much higher level,” said Foreign Ministry Director-General Yuval Rotem. Israeli Ambassador to Rwanda Ron Adam presented his credentials to Rwandan President Paul Kagame in February. The two countries established diplomatic relations in 1962, which were severed 11 years later after the 1973 Yom Kippur War. Ties were re-established in 1994 with Rwanda opening an embassy in Israel, closing it six years later due to budgetary constraints and reopening it again in 2015.